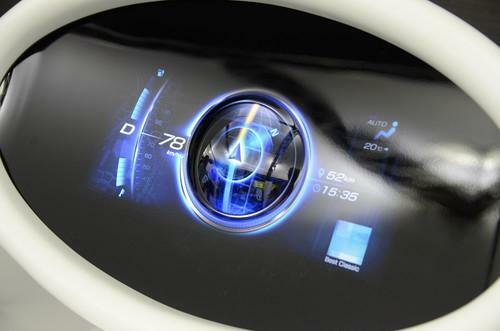 A prototype rear projection car dashboard developed by Mitsubishi Electric, on show at Ceatec 2013 in Japan. The projector is intended to sit inside the dashboard and project an image in place of the current instrument panel found in most cars. Both mechanical and digital instrument panels are based on inflexible components that restrict the freedom designers have in creating the dashboard. Often they sit on a flat surface behind a curved plastic front cover. Mitsubishi's projector can shine its image onto a curved surface so all of the information required by the driver could appear wherever it's needed on the dashboard. In a demonstration at this week's Ceatec exhibition in Japan, two mock-ups of instrument panels were shown. One had a concave face and the other a convex face. With light from the projector shining from inside the dashboard, it gave each face the appearance of being a large, curved digital display. Mitsubishi says it still has a fair amount of work to do before the system is ready for use in cars. It anticipates that won't happen until around 2017.